I searched the forum, then checked with Google's cache of pages and discovered that the name McDonald Birch has only been mentioned once in the history of this site. Which proved to myself, something I'd been idly pondering. Is Birch the most successful, yet overlooked magician of the last century? David Price suggests that being the 'nearly-man' for Thurston's crown never hurt the bank balance, but has he been left behind in the hearts of the historians? Has a nice biographical piece been published or presented that adds to Price's 5 pages? To continue my gentle provocation, please free to add any other stars of yesterday you may feel have been neglected. Has a nice biographical piece been published or presented that adds to Price's five pages? David Charvet's published an article about the 'tall grass' showmen of the last century in the August 1996 issue of MAGIC. Part of the article is devoted to McDonald Birch. Birch is one of those performers like Willard or Blackstone, Sr., who I've never heard, did a bad show. Birch does deserve more attention. T.A. Waters echoed that sentiment to me as well. Waters knew Tom Patterson,(they both lived in Columbus, Ohio) who had worked for Birch, on the road. I remember the late Lee Jacobs said he wanted to do a book on Birch. There still are those around who saw Birch perform. "McDonald Birch" doesn't show up in the Social Security Death Index. Any chance he's still alive? Maybe he has a non stage name? Thanks John. I have that article. Birch seemed equally home in legitimate halls as he had been on the Chautauqua circuit. Bill "the newspaper king" Mullins was very kind to take the time & forward a couple of great articles that backed that up. Diego always comes through with the scoop. Anyone know if Lee Jacobs got very far? The Birchs maintained a "memory room" of their past at their appropriately named "Birchwood" estate. retired to Malta, Ohio. If they are still with us, that's a story in itself. I believe reading in MAGIC and other magazines their obits...one or both died, with Alzheimers(spelling?) disease. The sources Gabe Fajuri used to research his wonderful book on Eugene Laurant, might be equally helpful in researching this fellow Chautaugua performer. Story goes that Birch swore off doing "Ghost Shows", when during the blackout, he couldn't see and fell into the orchestra pit, breaking a leg or ankle. One night, many years ago (sometime in the early or mid-sixties), I was in the audience for an evening performance by Birch and his wife. It was a star-crossed evening for, in the audience, was Harry Willard, C. Thomas Magrum, the successful school magician, and Pat Patterson of the Dr. Silkini shows. They were all trouping nearby and each had decided to catch the show. After the performance, we all ended up at the home of Elmer Newman in Decatur, Alabama for "refreshments". There was very little magic discussed. Curiously, the conversations seemed to center on the peculiarities of various stages and, in particular, different methods to access a suspended stage batten. Willard's solution was to tie a hammer to a rope and toss it over the batten, making sure that the hammer didn't fall back on one's head. It was a fun time. Birch's show was a well-done, flawless, smaller version of the larger full evening shows. His career covered the more rural areas and the lesser travelled roads with a family show. School auditoriums were his theaters and the audiences of that era welcomed his return. Yes, his story would make interesting reading. I was fortunate to see the Birch show in 1950. It was big (and appeared bigger), handsome, and wonderful! Birch is neglected. That's true even of some who should have known better. To put one line of inquiry to rest; both Mac and Mabel are dead. Mabel died on May 6, 1985. Mac died at age 90 on April 28, 1992. (Columbus, Ohio: 28 Jan 1902-28 Apr 1992) Aka "Birch the Magician". Raised in McConnelsville, Ohio. Inspired at age 10 by brother's magic set, learning from then until age 17 when in 1919 he turned pro stage magician with a minor Chautauqua circuit. Birch was on the cover of a Genii in either 1945 or 1946, and from what I remember he sounded like a hell of a magician (I'll dig it out later). I seem to remember Bob White telling me that Birch had made some money in real estate and that he retired very successful, but I might be confused. I'll dig up that old Genii later tonight. I've been out of town, or I'd have contributed sooner. Albeit Birch performed in Chatauqua for a few years, I'd not call him a 'chatauqua performer' in the same light as Laurant. A great performer, and a very nice guy, his success as measured at the box-office, the 'business' side of showbusiness, scores a real plus for his prowess. His show was purchased, including his semi-tractor-trailer, by Dr. Doug Dean of Lansing, Michigan, who kept some of the effects, and sold some others. I know this string covers a number of years ago but I wanted everyone to know that I have just released my new book, "Birch the Master Magician: The story of McDonald and Mabel Birch." It is 288 pps with over 200 photographs (many in color), hardbound with a dust jacket and traces their entire careers. It is based upon the research gathered by all-time Birch fan Charles McCall who passed away in 2013. I acquired all of his Birch memorabilia and research from the executor of his estate. There was no provision that a book be written but Charles did such a great job gathering it all I decided it needed to be done. There was no manuscript but all the research was there. By the way, four other people tried writing a book on Birch and none of them lived to see it completed. The jinx is over. If you are interested in obtaining a copy you can do so from your favorite magic dealer or directly from the publisher at 1878press.com. I hope you enjoy reading it as much as I enjoyed writing it. If you would like it autographed you can obtain it directly from me. Contact me at cardstar@verizon.net. Thanks. I have finished reading the book last weekend and enjoyed it very much! In my opinion, the writing was excellent. Thanks! I enjoyed writing it. With these stories - or any biography really - it's not so important that he or she played this theater or that theater. The key (which I learned from my friend Bill Rauscher) - is to get to the person/s behind the story. Bring them to life again. I certainly feel like I got to know this wonderful magical couple and of course, wished I could have known and met them, or at the very least seen their show. Again, thanks for your kind comment. For those interested in a sampling of Tom's remarkable work on McDonald Birch, check out his incredible post on Birch's throwing cards at Propelled Pasteboards, the throwing card blog, which can be found at http://throwingcards.blogspot.com/2017/01/mcdonald-birch.html. Mike Caveney has a wonderful Birch story in Classic Correspondence II. 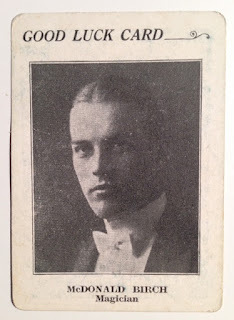 When Birch was a rising magic star in the 20s, Howard Thurston took notice and to rope Birch in he offered him a position as one of his touring franchise groups. Birch showed Thurston's contract to his stepfather who was an attorney. After reading the contract he advised Birch not to accept the offer because it was too one sided in favor of Thurston. Birch declined the offer. McDonald Birch was certainly one of the classier magicians to appear on the "You Asked For It" TV series. His "5 Second Packing Box Escape" was incredible (a "secret" given to him by Houdini, so it is said). Imagine performing a wooden packing box escape while wearing shoes, slacks and a closed double-breasted jacket (complete with outside pocket hanky). Not even a sweat or a hair out of place, as Birch suddenly appears from behind camera, as George Boston is about to smash open the crate! His "run-a-round curtain" ruse is a fooler; a departure from the more common "illusion steps". One wonders what Birch thought of friend Gen Grant - mentioning Birch by name and exposing the method in his "Rope, Chain & Box Escapes" booklet. There's a cover story on McDonald Birch in the February MUM. Re: McDonald Birch celebration weekend! For you Birch fans, the Twin Cities Opera House in McConnelsville, Ohio, hometown of Mack and Mabel Birch, will be celebrating all this year their 125th anniversary. To kick it all off, on April 29, we will put on a magic show in honor of the Birches. It will be called "A Return to Vaudeville." Performing that night will be Doc Swann, Howard Mincone and Scott Alexander. I'll do the MC work. We will also have a large display of Birch memorabilia. I'll open the evening with a video tribute to Mack and Mabel. I'll also be selling my new book on the Birches. Also will be offering a special Birch weekend discount on the book - $50. Normally it's $65. If you want the same deal contact me. PS - the theater in the Opera House is named in honor of Mack and Mabel.